Phlegmasia cerulea dolens (PCD) is a very rare but serious condition, which should not be overlooked. Despite little guidance being available, multidisciplinary input is essential and decisive and aggressive management can be lifesaving. 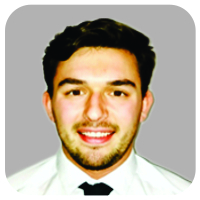 Department of Trauma and Orthopaedics, Bachelor of Medicine and Bachelor of Surgery, Aintree University Liverpool, Liverpool, England, United Kingdom. Department of Trauma and Orthopaedics, University Hospital Aintree, Longmoor lane, Liverpool, England, United Kingdom. Introduction: Phlegmasia cerulea dolens (PCD) is a rare pathology with a very high morbidity and mortality rate, which usually occurs in the lower limb. There is very little literature available to aid management. Case Report: We present a case of upper limb PCD in a 67-year-old female secondary to heparin-induced thrombocytopenia caused by warfarin bridging. She presented to the orthopedic team with upper limb compartment syndrome from a bleed around a peripherally inserted central catheter, for which she was urgently taken to the theater for fasciotomies. 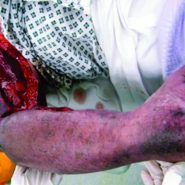 Postoperatively, the patient’s platelets dropped and the upper limb pain and swelling continued; after conservative management and anticoagulation failed the patient had an upper limb amputation of her right arm. Conclusion: With limited guidelines and management options restricted by the large fasciotomy wounds, we believe amputation was the patients’ best option. 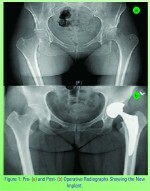 Keywords: Phlegmasia Cerulea Dolens, Amputation, Orthopaedic, Vascular, Deep vein thrombosis, Heparin Induced Thrombocytopenia, Haematology, Compartment Syndrome. Phlegmasia cerulea dolens (PCD) is a rare form of deep venous thrombosis occluding all venous return distally. Usually triggered by either malignancy, venous catheterization, heparin-induced thrombocytopenia (HIT), or pregnancy, diagnosis is based around a triad of acute pain, limb swelling, and cyanotic changes [1, 2]. Prognosis is poor and 40–60% of cases progress to venous gangrene , this is associated with a mortality rate of 41% and amputation rates up to 50% in survivors . Nearly, all cases presented in the literature involve the lower limb [2, 5, 6, 7]. Our case highlights the importance of recognizing that the condition can affect the upper extremities. We report a case of venous gangrene in the upper limb secondary to HIT. Patients with HIT have a 40% chance of forming a venous or arterial clot , and 10% of all deep vein thrombosis (DVT) occur in the upper limb, and phlegmasia is a recognized complication of any DVT . Once the thrombosis has developed into phlegmasia, there are no clear guidelines for treatment, and often the condition is managed on a case-by-case basis depending on the stage of the disease. This report aims to improve early recognition of the condition and discuss the management options available. We present the case of a 67-year-old female who underwent emergency amputation of her right arm following PCD. The patient presented to the emergency department 3 days after discharge with right calf pain, pleuritic chest pain, and a swollen painful right shoulder. 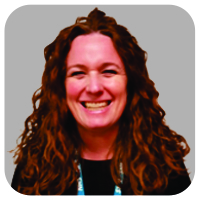 She had developed a DVT in her right arm following insertion of a peripherally inserted central catheter that was inserted for long-term antibiotics to treat a community-acquired pseudomonas pneumonia. She was, therefore, commenced on warfarin and on treatment-dose low-molecular-weight heparin until her international normalized ratio (INR) was in treatment range for DVT. Her admission laboratory investigations revealed an INR of 4.1, platelets 56, C-reactive protein 326, and a normal lactate level. Following admission under the medical team, her upper limb pain progressed despite analgesia and an orthopedic opinion was sought. The patient was diagnosed with compartment syndrome by the orthopedic consultant and taken to the theater for upper limb fasciotomies. During surgery, the anterior and posterior compartments of the arm were opened, as were the volar superficial and deep compartments of the forearm. Intraoperative findings confirmed compartment syndrome secondary to a large posterior compartment bleed. Postoperatively, she was reviewed by the hematologists due to her platelet count of 47 who diagnosed HIT, triggered by the heparin bridging on her previous admission. At this stage, her post-operative risk of bleeding was higher than her risk of thrombosis, so no anticoagulation was started. 24 h later, the patient complained of extreme pain and paresthesia in the arm and the hand was mottled. With concern for peripheral perfusion, regular Doppler monitoring of arterial flow to the hand was commenced. 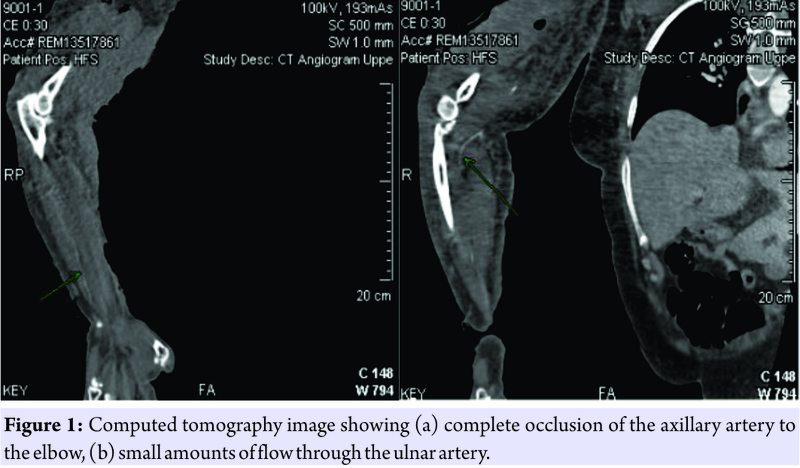 The patient’s creatinine kinase increased significantly from 837 u/l to 4895 u/l and an urgent computed tomography angiogram was performed, showing no significant arterial flow in the arm beyond the bifurcation of the axillary artery at the elbow, and patchy ulnar artery flow (Fig. 1a and b). The scan also revealed a large pulmonary embolus, an aortic clot causing renal ischemia and a lower limb DVT (Fig. 2a, b, c). The patient was anticoagulated on fondaparinux following the advice of the hematologists. Several hours later, a venous Doppler was performed that showed no venous return in the axillary, cephalic, or subclavian vein. A vascular consult at this time deemed the arm viable and advised elevation and anticoagulation. 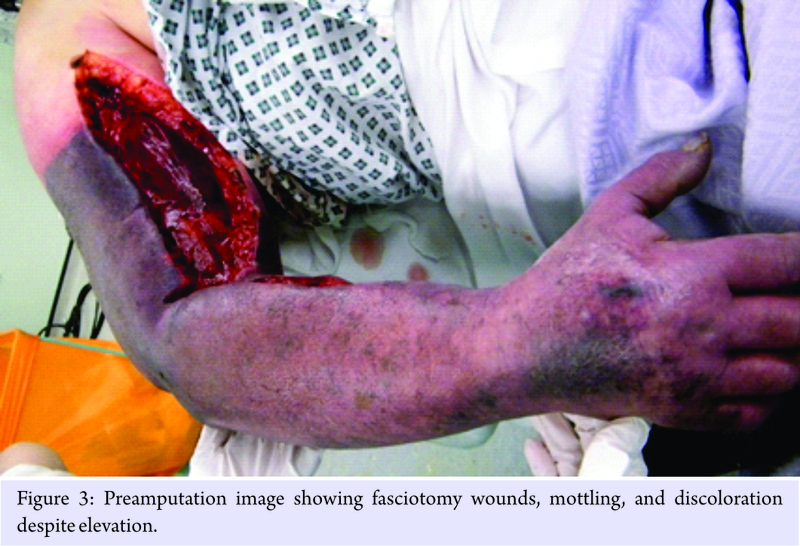 72 h post-fasciotomies, the arm was still grossly discolored, increasingly painful and paralyzed (Fig. 3) but with partially identifiable arterial flow on Doppler. Creatinine kinase had risen to >8000 u/l. A multidisciplinary team decision was made, including senior orthopedic and vascular consultants, and a discussion with the patient, to amputate the arm following the diagnosis of PCD. Intraoperative findings confirmed venous gangrene. Following a 24 h stay on the intensive care unit, the patient made an uneventful post-operative recovery and was discharged home several weeks later. Months postamputation, her wounds have healed, and she is rehabilitating with an above elbow prosthesis but has been hampered by phantom limb pain. HIT is an unpredictable complication of heparin therapy, and venous thromboembolism is the most common presentation of this . Progression to PCD and venous gangrene is very rare. Our patient presented to orthopedics with a severely painful, swollen upper limb, an INR of 6.2, and recent trauma to the brachial vein. Clinical diagnosis of compartment syndrome was made, and emergency surgery was needed to decompress the compartments in the arm. Intraoperative findings confirmed bleeding into the posterior compartment and necrosis to triceps brachii, justifying the need for surgery. This operation severely restricted therapeutic options further down the line as systemic thrombolysis was now contraindicated due to the risk of bleeding from the fasciotomy wounds. The heparin used during bridging therapy from her previous admission converted the patient from a hypocoagulable state to hypercoagulable state as she developed HIT. We postulate this caused her post-operative PCD, and once diagnosed options were limited. There are no clear clinical guidelines for diagnosis and management of phlegmasia, and its only classification is into non-complicated, impending venous gangrene and venous gangrene . 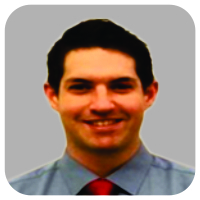 Current therapeutic options include systemic thrombolysis, catheter-directed thrombolysis (CDT), surgical thrombectomy or transluminal angiography ± stent . The first-line treatment is generally considered to be CDT, for our patient this would not have been a viable option due to her low platelet count , as for safe CDT there needs to be no obvious bleeding risk. Systemic thrombolysis would have been at high risk of bleeding due to such a low platelet count and large fasciotomy wounds. Despite this, on hematological advice, she was started on low-dose fondaparinux and monitored for signs of bleeding. After 36 h, this showed no clinical benefit. Surgical thrombectomy was the only option available; however, there are a lot of recognized complications, little evidence of its benefit in the upper limb and patients are at high risk of reclotting. It is also noted that delay in diagnosis and treatment is extremely poor prognostic factors and aggressive treatment in patients with impending venous gangrene can reduce morbidity . At this stage, considering the number of comorbidities, our patient had we believed amputation was the patients’ best chance of survival. Our case presents a unique and complex patient with PCD, secondary to venous catheterization and HIT, in the presence of upper limb fasciotomies. No guidelines or evidence base exists for such patients. We believe that aggressive treatment of amputation provided her with the best chance of survival. We would like to use this report to draw attention to phlegmasia as a differential of the painful swollen limb. Although a rare pathology, the extremely high morbidity and mortality rates mean it should not be overlooked. This is a rare case and reminds us that it is not just a complication of the lower extremities and it is important to understand the underlying cause of the clots. The report also supports the previous understanding that when faced with phlegmasia an early intervention and aggressive management can be life-saving. There is very little literature to guide management, but we have explored all the options and examined why each would or would not have been appropriate in this case to aid future management of phlegmasia. 1. Warkentin TE, Elavathil LJ, Hayward CP, Johnston MA, Russett JI, Kelton JG, et al. The pathogenesis of venous limb gangrene associated with heparin-induced thrombocytopenia. Ann Intern Med 1997;127:804-12. 2. Sarwar S, Narra S, Munir A. Phlegmasia cerulea dolens. Tex Heart Inst J 2009;36:76-7. 3. Lorimer JW, Semelhago LC, Barber GG. Venous gangrene of the extremities. Can J Surg 1994;37:379-84. 4. Perkins JM, Magee TR, Galland RB. Phlegmasia caerulea dolens and venous gangrene. Br J Surg 1996;83:19-23. 5. Ikegami T, Kuriyama A, Matsukubo S. Phlegmasia cerulea dolens. QJM Int J Med 2016;109:281-2. 6. Barham K, Shah T. Images in clinical medicine. Phlegmasia cerulea dolens. N Engl J Med 2007;356:e3. 7. Bhatt S, Wehbe C, Dogra VS. Phlegmasia cerulea dolens. J Clin Ultrasound 2007;35:401-4. 8. Warkentin TE, Kelton JG. A 14-year study of heparin-induced thrombocytopenia. Am J Med 1996;101:502-7. 9. Chinsakchai K, Ten Duis K, Moll FL, de Borst GJ. Trends in management of phlegmasia cerulea dolens. Vasc Endovascular Surg 2011;45:5-14. 10. Chaer RA, Dayal R, Lin SC, Trocciola S, Morrissey NJ, McKinsey J, et al. Multimodal therapy for acute and chronic venous thrombotic and occlusive disease. Vasc Endovasc Surg 2005;39:375-80.